The RNLI is a registered charity that saves lives at sea, on lakes and inland waterways. It has provided a 24-hour on-call lifeboat service to cover search and rescue requirements out to 100 nautical miles from the coast of the United Kingdom and the Republic of Ireland since 1824. The RNLI is recognised as one of the most efficient lifeboat services in the world. There are 235 lifeboat stations, and 160 lifeguard units not only around the coast but also on inland waterways, lakes and on the River Thames. Lifeboats are manned by highly trained with largely volunteer crews. Every penny spent to maintain the lifeboat service is raised from voluntary contributions and legacies for its income. The RNLI is proud of its independence from Government status yet works with the Maritime Coastguard Agency and the Irish Coast Guard and other organisations to provide a co-ordinated rescue service. Since the RNLI was founded in 1824 its lifeboats and lifeguards have saved more than 140,000 lives. More and more people are using the sea for leisure and lifeboat crews and lifeguards are responding to an increase number of incidents relating to people engaged in recreational pursuits. Lifeboat crews are mostly volunteers, who come from all walks of life, and give up their time and comfort to carry out rescues and save lives at sea on the lifeboats. With over 4,800 lifeboat crew members in the United Kingdom and Republic of Ireland, of which 350 are women, lifeboat crews are dedicated to make a major commitment – which could ultimately include risking their life. They respond at a moment’s notice no matter where they are or what they are doing when the pager goes off. Crews are regularly called away from their families, their beds and their work, 24 hours a day, 365 days a year. Often they’ll leave their place of work or comfort to readily exchange leisure and sleep to brave cold, wet and fatigue in situations that test their skill, strength and courage. Their lifesaving work is essential, often difficult and sometimes dangerous. RNLI volunteers across the UK and Republic of Ireland are united by a willingness to commit time and energy to a cause about which they are passionate. 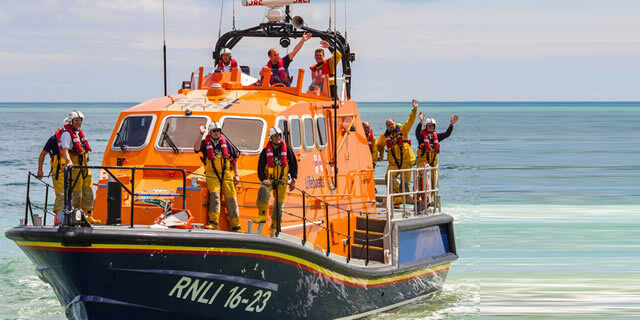 It is because so many crewmembers, shore-helpers, fundraisers and others are volunteers that such a high proportion of funds can be spent on first-class lifeboats and equipment. They have one thing in common: they selflessly make time in their own lives to save others. These days, less than 10% of crew members come from maritime backgrounds. So it essential that the RNLI provides first class training to make sure its crews have the skills they need to save lives. A lifeboat station was established in Eastbourne in 1822, two years before the RNLI itself was founded. The Institution did not administer the Station until1853. Boathouses for the lifeboats have been in a number of locations over the years. The first dedicated boathouse being in Marine Parade and Marine Road, then at the bottom of the Wish Tower slopes. In 1903 a new boathouse was built at the Fishing Station in Royal Parade. This is still used today for housing the Eastbourne Inshore Lifeboat. In 1993 the All-weather Lifeboat moved to Sovereign Harbour and a new facility was built shortly afterwards. RNLB ‘Diamond Jubilee’ lifeboat was officially named by the Earl and Countess of Wessex in July 2012. She replaced the old Mersey class lifeboat ‘The Royal Thames’, which had been on service since July of 1993. In that time the volunteer lifeboat crew launched on 960 occasions and rescued 1,520 people – of that number, 155 people were classed as ‘lives saved’. and this new lifeboat will give our volunteer crew the speed and safety they need to continue saving lives at sea. The Tamar class is a state-of-the-art lifeboat and the most advanced in the RNLI fleet. Fitted with an integrated electronics Systems and Information Management System (SIMS) designed to offer the crew the ability to monitor, operate and control many of the boat’s systems directly from the safety of their bespoke shock-mitigating seats. . They also incorporate essential controls such as throttles and a joystick with the trackball for the SIMS screen close to hand. SIMS provides access to all communications (VHF, MF, DF and intercom), navigation (radar, chart, DGPS, depth and speed) and machinery monitoring including engines, transmission, fuel and bilge. The Tamar’s propellers and rudders lie in partial tunnels set into the hull that, along with steel-lined main and bilge keels, provide excellent protection from damage in shallow water or slipway operations. In addition to her twin engines, the lifeboat is fitted with a hydraulic-powered bow thruster for improved manoeuvrability. The Tamar carries a Y boat, an inflatable daughter boat housed under the aft deck and deployed from a hinged door in the transom. The Y boat has a 15hp outboard engine and is used in moderate conditions to access areas the lifeboat cannot reach. Eastbourne RNLI’s inshore lifeboat ‘Laurence & Percy Hobbs’ Operational number D-744 was officially named by members of the benefactors family at a dedication service held on the beach at Fisherman’s Green in December 2011. The new inshore lifeboat was funded with a generous legacy from Louise Hobbs who sadly passed away in 1999, aged 96 years; she bequeathed part of her estate to Eastbourne RNLI lifeboat station. The legacy was for the specific purpose of funding a replacement for the D-class inshore lifeboat (ILB) when it reached the end of its serviceable life. The new £39,000 lifeboat is named after Louise’s father, Laurence John Hobbs, and brother Percy, neither of whom are alive today. With the tighter dimensions, less elastic material, improved floor boarding system and a pod to house electronics, anchor, anchor rope, and first aid kit the new boat is some 50% faster than some of the older inflatable boats. Fitted with a new 50hp engine the boats are very responsive to helm input and rapid for transiting to search area or casualty. This year at the 999 Display you will have the opportunity to meet with the crew of the Eastbourne Lifeboats. Souvenirs will be available to purchase from our Fundraising stall located in the main marquee. Come and meet with us during this exciting weekend. Six out of ten RNLI launches are only possible thanks to gifts in Wills.